CADR ratings are given by the Association of Home Appliance Manufacturers. AHAM is an organization that test different appliances. Some manufacturers submit their air purifiers to AHAM for testing. This is voluntary testing. Right now 29 companies participate in the testing. Look for the AHAM seal on the box. Have you seen a seal like this before? This seal shows the rating for an air purifier. What do the numbers mean? How are they important? We're sure that you have asked yourself these questions. Well, we want to answer them for you. We will explain what these numbers mean and how that is important to you. 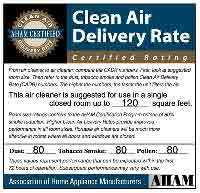 AHAM test each air purifier and give it a Clean Air Delivery Rate (CADR) number. These ratings can be used to compare air purifiers. When you look at the seal, you can see for numbers. This first number is the recommended room size. The next number are for dust, tobacco smoke, and pollen. Tobacco smoke: This represents the smallest size particles. Dust: This represents medium size particles. Pollen: This represents the largest sized particles. Out of these three number the number for tobacco smoke is probably the most important. Smoke is the smallest and most intrusive. If an air purifier can remove smoke, it most likely will remove everything else well too. The test is standardized. The room is 1008 cubic feet. Because of the room size, the maximum ratings are 400 for dust and 450 for smoke and pollen. You should not see an air purifier claiming higher numbers. If they do, the number cannot be backed up by the test. They test for particles from 0.1 to 11 microns. This is the size of most common pollutants. The numbers show the total volume of air cleaned of a pollutant in one minute. Let's say the dust number is 200. This means 200 cubic feet of air are cleaned of dust in a minute. The higher the number, the better the air purifier will work. If everything else is equal between two air purifiers, you can pick the one with the higher CADR value. AHAM has a 2/3 rule. They recommend you choose a purifier with a tobacco smoke CADR 2/3 of the room's size. A room 12 feet by 15 feet is 180 square feet. The tobacco smoke CADR ratings should be at least 120 square feet. This assumes there are 8 foot ceiling. If the ceiling are higher, you will need an air purifier with a higher rating. Our biggest concern with the CADR ratings is they are voluntary. Manufacturers are not required to submit air purifiers for testing. We appreciate the ones that do. There are many high quality air purifiers that have not been submitted for testing. They do a great job, but a CADR number is not available for them. You will see us recommend air purifiers without CADR ratings. This is because we know that they do a great job. Remember CADR numbers are just a tool to use. They are not the only thing to consider when you shop for an air purifier. CADR ratings are recognized by the EPA and the American Lung Association. When you are shopping for an air purifier pay attention to the numbers, but remember they are just a guide. There are many great purifiers that do not have CADR numbers. If you are comparing two air purifiers and they both have CADR ratings, you can pick the one with the higher number. This will give you the better air purifier. As long as the particle size and filter efficiency is the same. Make sure that you are using CADR numbers. Air volume is called air exchanges. This is the number of times the total volume of air in the room is cleaned. Sometime this number is used instead of CADR numbers. This is not the same thing. It is important, but it is not the clean air delivery rate. Leave CADR Ratings and Return to All About Air Purifiers Home Page.